Hello, and welcome one and all to the Your First Digital Marketing Weekly Roundup of 2017! What an exciting year for digital marketing 2016 was. 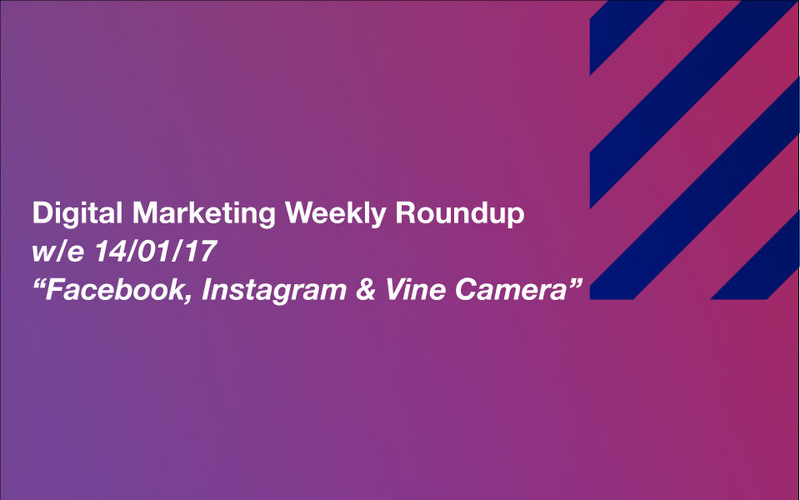 Updates galore each and every week (check out our Digital Marketing Yearly Roundup to see what you might have missed). This week, we’ve got updates from Facebook, Instagram and – perhaps surprisingly – Vine. Right off the bat for 2017, we have an important update in the world of video. Video, as those of you who follow our Weekly Roundups will know, proved to be the most important focus point of 2016, and here it seems that we can expect more of the same over the next 12 months. Facebook have recently launched (without much fanfare) a free automatic video subtitling tool to all US English Facebook Pages – so we can reasonably expect a greater roll out over the coming weeks or months. You may well have noticed it yourself – a number of those auto-play vids that start rolling when you scroll through your news feeds have started displaying subtitles. “Facebook first rolled out auto-captioning for video ads in February 2016, in an attempt to make its advertising channel more competitive with platforms like YouTube that always play clips with the sound on. The feature could potentially expand to user-uploaded videos but Facebook refused to comment on future plans. The tool is powered entirely by voice recognition software (which is pretty cool – though a few bloopers will undoubtedly emerge over time), and currently only available to Business Pages – which means people like you and me (i.e. marketers) need to take the steps to turn the feature on. This is a good update – people will be able to understand our video marketing content even when they’re in situations when it’s not appropriate to have the sound up on their phones, ensuring more views, and longer views. Nice one. It really was a sad day last year when it was announced that, alas, Vine would soon be no more. I used to love Vine – both on a personal and professional level (more so on the personal one, as it happens). But, hey-ho, nothing lasts forever. And now we have a date – January 17th, which is just next week! So, first thing’s first. If you’ve got marketing material on Vine that you want to keep, YOU NEED TO DOWNLOAD THIS BEFORE NEXT TUESDAY. Next – what’s the Vine Camera all about? So, essentially, the Vine Camera is being integrated as a new feature for Twitter. I think this is a good thing – those 6.5 second loops are great for light-hearted video marketing purposes, and I’m pleased that they haven’t completely vanished forever. So, all in all, the blow of losing Vine has been somewhat softened – just make sure you download all your vids before the January 17th deadline. Who’s in charge of Instagram marketing at your office? Have they got an iPhone 7 or 7 Plus? Well, if they have, then a new Instagram feature has now been (almost) fully rolled out exclusively to those fancy-pants-people with the latest Apple handset. Not a bad little update for those that can access it – visual marketing in 2017 is going to be big, so creating the best visuals possible can only assist our successes. Time for me to upgrade my phone. That’s it! Let’s hope 2017 is even better than 2016. See you all next week!